Thanks, Robert. If you have access to or know of anything specific about the breccia, I'd love to have the references. Most things I've read just cite it as a fault breccia with no further comment, other things I'm not sure are referring to the same breccia, e.g. this about the Tertiary Titus Canyon Formation. Locations in the pdf are obscure, and no photos of the breccias referred to. Additionally, a couple refs mention collapse breccia, as though the thing formed from cave collapse, but those citations are general and made by passers-through, not by geologists. Anyone wanting to comment on this blog or other Blogger blogs may need to use Firefox rather than Internet Explorer. Blogger does not have the sign-in problem fixed. I just entered an endless loop trying to comment here, even though they recognize my sign in at the Blogger dashboard. Ugh. Gorgeous pictures! I hope to make it out there sometime to see the outcrop in person! Amazing! That may be the most memorable outcrop of many in Titus Canyon. I've been on that drive I think 6 times, and another walk-in from the top of the fan. 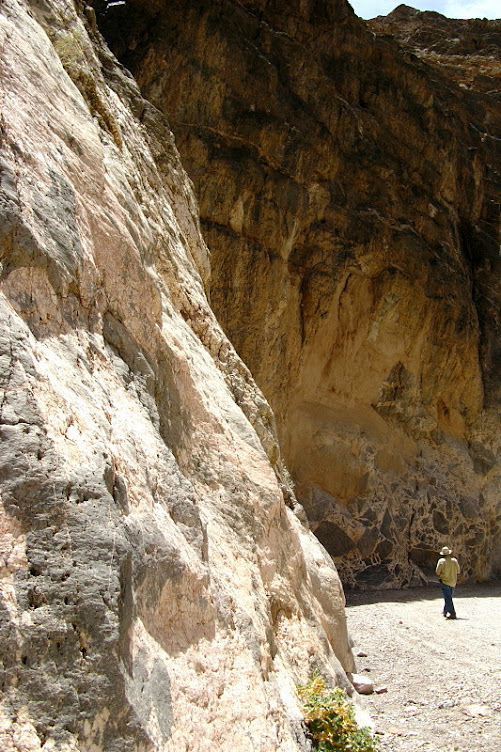 The megabreccia is a short walk from the parking lot at the mouth of the canyon, and if your time budget is limited, that may be a preferable option than the several hour drive. However, if you do have time, the whole drive through is awesome. Regarding its origin, I know I've read suggestions in a couple of places that it might be a hydrothermal/phreatic breccia, but almost everything I've read that's actually coming from geologists includes that coded geospeak phrase, "not well understood." Which in regular English means "no one knows with any confidence." Here are two links to field guides I've used with info on the breccia. Does the Oligocene Titus Canyon Formation include the breccia? It includes megabreccia. It has a carbonate breccia at the base, grading laterally or upward into a sedimentary breccia, and also into mudstones and conglomerates, all having something to do with a tectonic basin. Or something like that. @GeoGirl Thanks! Let us know when you get to the outcrop. 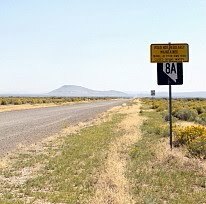 @Howard, I hadn't considered walking in from the west side, from the alluvial fan - that's a good idea, since one can't always be coming from Beatty! @Robert, thanks for the book ideas! I'm thinking it's not the same breccia. Mr. Lepeer's explanation is what I have heard also. I visited that formation while in a UCLA geology class, and heard that explanation, those it was admittedly uncertain. It also makes sense given the nature of that limestone, which is Cambrian. If you explore around, you will find many types of calcite formations in the limestone (unfortunately all my pictures of it are pre-digital). 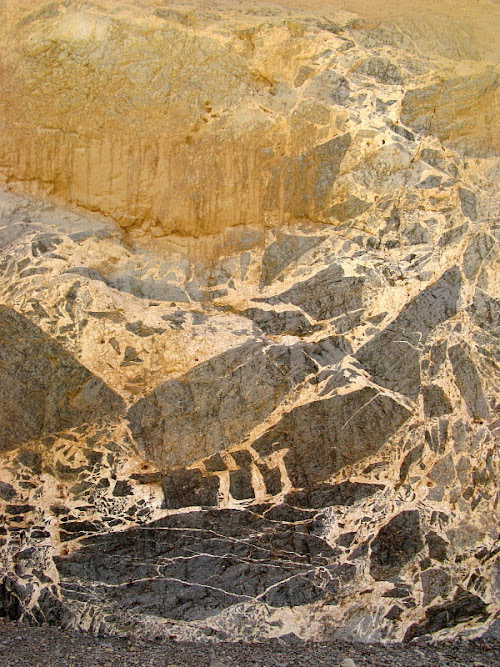 The calcite formations are not limited to this breccia formation. dmbeaster, Thanks for adding some info from your UCLA class. My Megabreccia III post shows some more pictures of the breccia, some of which look hydrothermal (or phreatic) to me. Silver Fox. (this is dmbeaster, but I may sign in under another name) Was rereading this, and the Titus Canyon Formation and its breccia formations are different from this limestone exposure. The Titus Canyon Formation is located mostly northeast of your picture location by around 10 miles. They are Oligocene in age - this limestone is Cambrian. 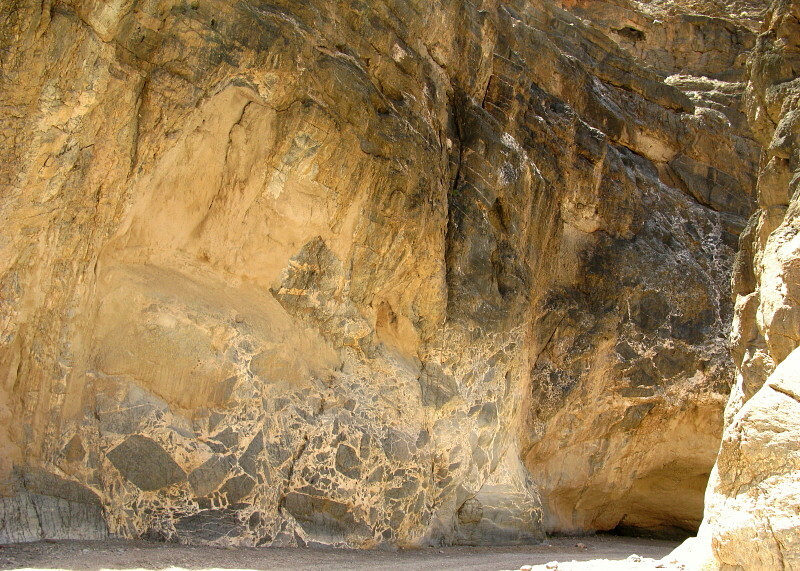 The Titus Canyon Formation is a sediment basin deposit, whereas the limestone here is marine. I also find the hydrothermal explanation as the most plausible. Who knows when it occurred, but long after this limestone was deposited and buried. As I mentioned above, there are other calcite formations in the area found in this limestone which also suggests a hydrothermal source, although they are not breccia formations. I was looking for my pictures of these features taken long ago, but did not easily find them. Thanks, David/dmbeaster, for the confirmation. I'd decided the Oligocene breccia couldn't be the same thing, though it is described as containing a megabreccia at the base. There may be some info on the Titus Canyon breccia in a Special Paper, but so far, I've been too busy to see if I can look that up through Bloc of Docs, or if I have to buy the whole thing. Also, still meaning to get the Death Valley geology and hikes books mentioned by Robert Leeper. I particularly recommend the hiking book that he mentioned by Digonnet. I am a lifelong hiker and read these kinds of books for fun. That is an amazingly good book with great hike descriptions. Death Valley has many interesting narrows in the side canyons, and is a great place to go hiking from October through April. I found it interesting that you posted these pictures of the exact same formation that I saw as part of a geology field class 35 years ago, and many times since.